i Click 'view all' to instantly compare this ok deal with offers on other top geometry sets. 6 Pcs Ferocious Viking Geometry Compass Geometry Set for School is currently selling at $9.99, which is its normal price. It has a lowest price of $9.99 and is selling within its usual range. Price volatility is 0.15% (meaning it does not change often), so you might have to wait a while for the price to drop. Until then this is a recommended 'ok deal'. The current deal is also the best price on this item over the last month. 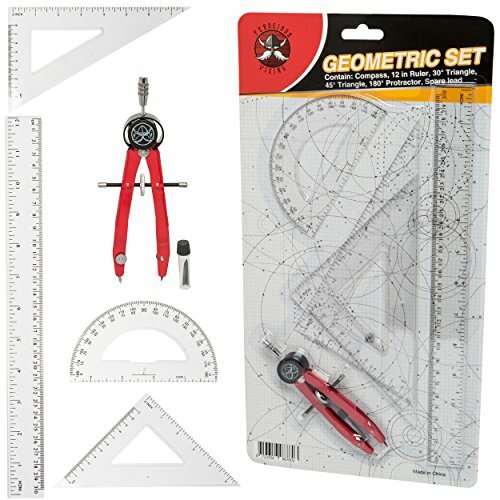 Compare the current price, savings (in dollars & percent) and Buy Ratings for the top Geometry Sets that are closely related to 6 Pcs Ferocious Viking Geometry Compass Geometry Set for School. Here is how 6 Pcs Ferocious Viking Geometry Compass Geometry Set for School compares with other leading Geometry Sets. ?Geometry Set for School Start This set is perfect for the student that is starting in school and need the basic supplies to get along. This set will give you that extra edge. Let's face it, this set just is MORE COOL. 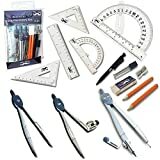 ?Perfect for Math Work Whether you are taking geometry classes or just need to make the occasional pie chart, having the ability to create accurate, drawings with a precision instrument is a must for the serious student. When bisecting angles or constructing geometrical figures, you want a compass you can rely on. ?Everything you need in one set In this set you will get everything you need to get along in class or on the job. The compass and rulers are all you need to get stellar grades in Math, Science and Engineering classes. ?Coolness unheard of in a School Start Set The coolness of the compass and rulers in this set is over and beyond what is normally found in similar sets. The compass along is super cool and will give you an extra edge when it comes to Math and Geometry class, Drafting and artistic drawing. 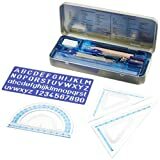 FeaturesGEOMETRY SCHOOL SET CONTAINS - A super cool Compass with a 12 inch straight ruler with both metric and imperial units, two Set Squares, one with 45-45-90 degrees and one with 30-60-90 degrees and a protractor.SUPER COOL COMPASS - We have all tried using a cheap uncool plastic compass that can't hold the shape for even a single circle and forces you to have to try again. With this cool compass you will not have that problem. 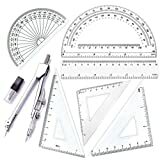 This compass will make a circle 10 inches in diameter.VERSATILE RULER SET - The Geometry Set comes with a ruler set consisting of a Straight ruler, two Set Squares, all featuring both inches and centimeter units, and a Protractor. The Straight Ruler is 12 inches long, the first Square Set is a 45-45-90 degrees triangle, the second is a 30-60-90 triangle. The set is neatly packaged in a cool package.IDEAL FOR MATH CLASSES AND SCHOOL - This set has everything a student needs to get started in math class from Elementary school through High school. Who wouldn't want to have a Ferocious Viking Geometry Set?